As the cinematic debut of Steven Spielberg (even though it was originally produced as a TV movie, this is as much of a movie as any), Duel has some undoubtedly big shoes to fill, and that's the case whether you think Spielberg is infallible or intolerable. Possibly you're aware that I'm much closer to the former camp, and if there's one thing that keeps me from loving Duel entirely, it's the knowledge that Spielberg would only improve (for many filmmakers, it would be an easy career high). On its own, it's a startlingly pure, assured piece of psychological horror indicative of a major talent with an instinctive approach to subjectivity. Adapted by Richard Matheson from his own short story, it was successful enough on television to get a theatrical re-release years later, and as a result, two primary cuts of the film exist: the 74-minute theatrical cut, and the 90-minute cut expanded for theaters (the only version I've seen, an oversight I intend to correct), and available more or less intact on DVD (some shots and voice over lines have been removed). My feelings about the film haven't changed over the years; even seeing it in theaters, there remained some pacing issues, which isn't entirely unexpected when a filmmaker - especially a young one - tackles a project of such daunting conceptual limitations (hell, even a veteran Michael Mann could only come up with so many in-vehicle camera angles in Collateral). The main (and in most ways only) character here is one David Mann (Dennis Weaver, a superior everyman), who is traveling in his Plymouth through desert country on a business trip; a tanker truck on the rode first annoys, then obstructs, then attempts to kill him, beyond any reasonable doubt. We (the audience) catch an insubstantial glimpse of the would-be killer at least once, but Mann remains entirely in the dark as to the face of his predator. One of the more nail-biting features of the latter 20th Century; it just grazes the edge of existentialism. Seen in his filmography, the film's rusted, growling tanker truck is an obvious predecessor to the man-eating Great White of Jaws, sharing in its pitilessness. And it's every bit as terrifying. You ought to check out the 90-minute cut, Rob. It's got some essential scenes to it. One of them has Mann hysterically requesting help from a school bus driver stranded on the side of the road, with the kids on the bus all looking at him like he's crazy (and then the diesel truck itself breaks character by helping the bus off the side of the road!). Another scene has Mann stopping off at a diner and then looking around paranoid because he's worried that the driver might be in there eating with him (I can't recall if this scene was in the original television cut). Interestingly, when Spielberg went over to the UK for the movie's theatrical premiere, the British intellectuals in the audience grew annoyed when he refused to endorse their suggestions that the truck represented "the establishment". 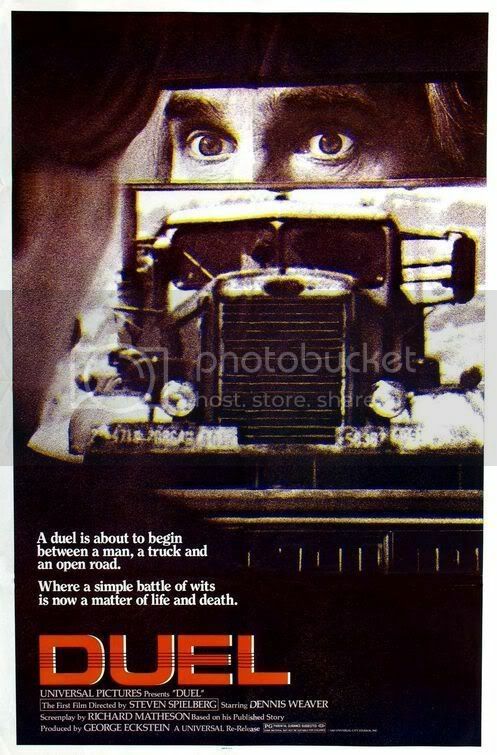 The three new scenes added to bring DUEL to feature length for theatrical showings (all written by Spielberg himself) were: the telephone conversation between Mann and his wife; the incident with the bus; and the trucker's attempt to push Mann's car in front of the moving train. Matheson said he wasn't crazy about the scenes, but didn't know how else they would have achieved their objective. His only real objection was that it was his intention to have no physical contact between the two vehicles until the end. I'm not aware that the 74-minute cut is commercially available. For further information, see my book RICHARD MATHESON ON SCREEN (http://www.mcfarlandpub.com/book-2.php?id=978-0-7864-4216-4). There appear to be two 90 minute cuts out there. One is about 89 minutes and the other about 86. The 86 minute version has some things cut from the end: Dennis Weaver jumping about manically after his victory, and some shots of the truck after it goes off the cliff are two things I've noticed. Unfortunately I have the cut DVD. If anyone knows of the correct UK release that is uncut please let me know. My DVD number is 822 468 6 - 11.